Seeing the same sidebar on my site day after day gets boring — even for me — so I can just imagine how blind regular readers become to sidebar messages when the message never changes. There is a solution to sidebar blindness though — create different sidebars for different categories, posts and pages. 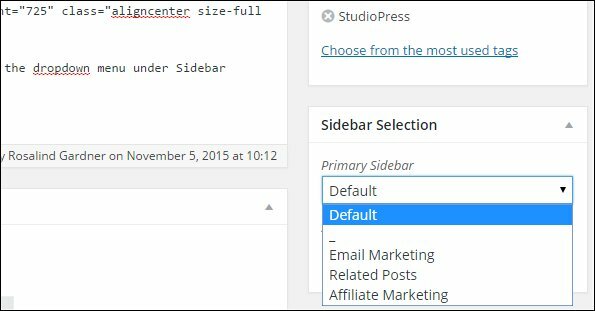 In this post, I'll show you how to create a custom sidebar for categories, posts and pages using the Genesis Simple Sidebars plugin, designed specifically for Studiopress Genesis users. 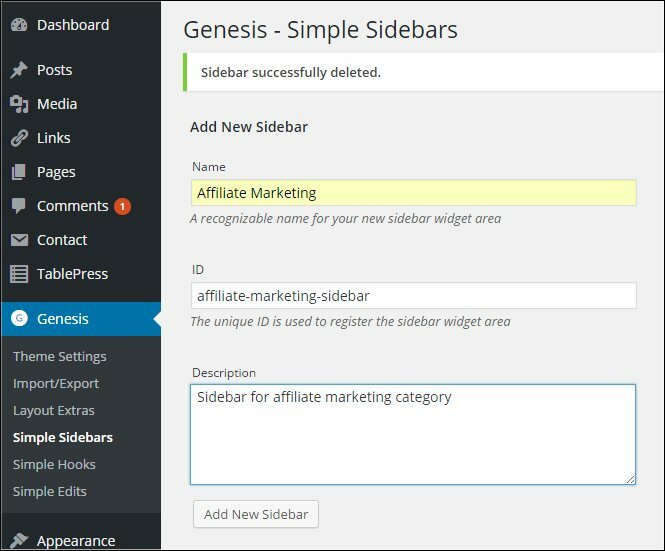 Download, install and navigate to the Genesis Simple Sidebars plugin for WordPress in your Administration Panel. By the way, if you don't use StudioPress themes or Genesis, other plugins are available that do the same thing — just not the same way. Go to Plugins > Add New and search for “custom sidebars”. Enter a unique ID for the sidebar, e.g. affiliate-marketing-sidebar. Remember not to leave any spaces. Adding a description for the sidebar is optional. To add widgets to your new sidebar, go to Appearance > Widgets. In the graphic below, you can see that I've placed Search, Text and 2 Custom Menu Widgets in the Affiliate Marketing sidebar. To attach the new Affiliate Marketing sidebar to the Affiliate Marketing category, I went to Posts > Categories and clicked on Edit below Affiliate Marketing. That opens up the page shown in the following graphic. 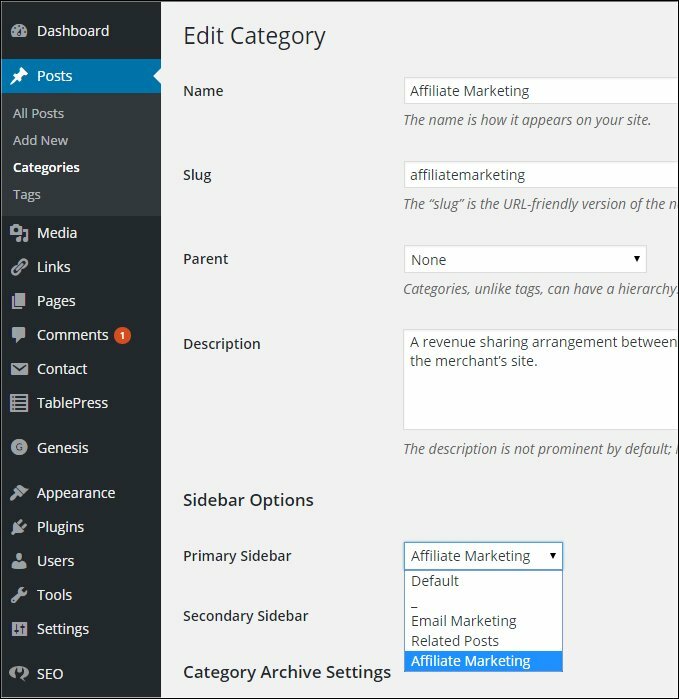 Navigating to Sidebar Options near the bottom of that page, I selected Affiliate Marketing in the Primary Sidebar drop-down. To change the Primary Sidebar within a Post or a Page, open up the Edit Post (or Page) window and select from the dropdown menu under Sidebar Selection. 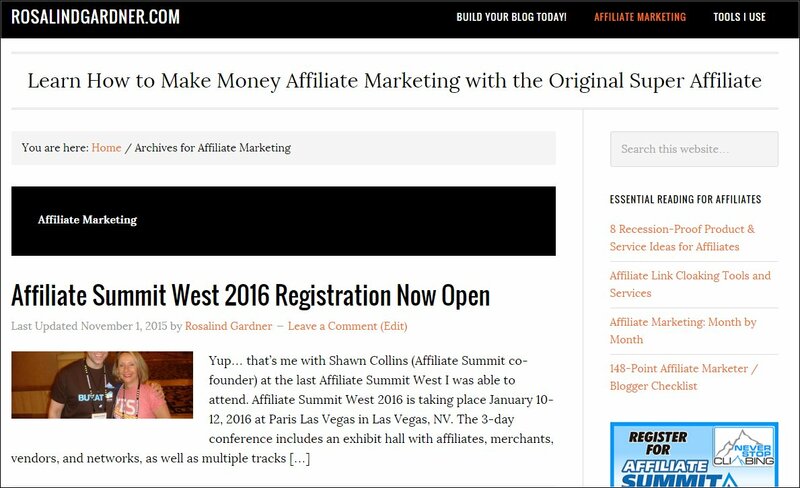 This is how the sidebar now appears in the Affiliate Marketing category on this site. Did you find this post about creating custom sidebars useful? If so, please share it with others! 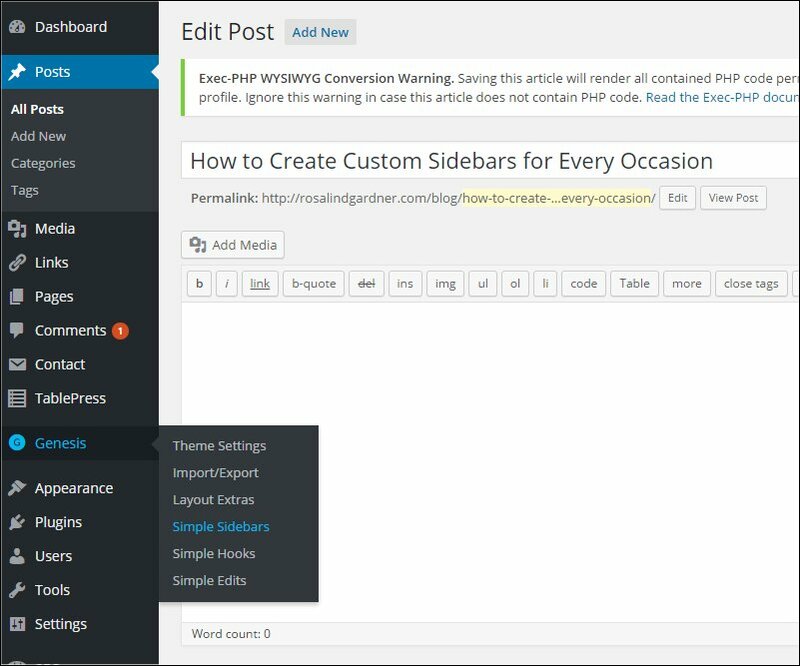 If you have a comment or question about these WordPress tips, please leave a comment below! Never thought about that … thanks Rosalind. I want to improve the stickiness of my site. Great post. I also use genesis sidebars on my blogs. Its great to be able target advertising, affiliate offers or just related topics to my audience. It really keeps my sidebar content relevant to my page/posts and creates a better experience for my audience. That’s great to hear, Karen. Thanks for sharing!